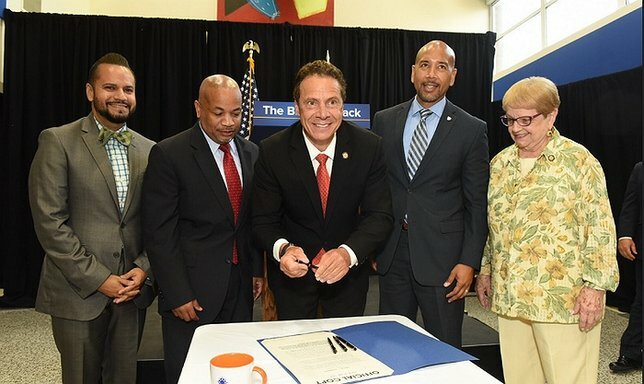 Governor Andrew M. Cuomo announced bold actions to increase the number of minorities in the State government workforce. Photo by: Office of Governor Andrew M. Cuomo. Albany, NY - March 27, 2017 - Governor Andrew M. Cuomo today announced bold actions to increase the number of minorities in the State government workforce, including advancing legislation to accelerate the hiring of highly-qualified diverse candidates and expanding access to Civil Service exam preparation and tests. The actions were recommended by the Governor’s Advisory Council on Diversity and Inclusion. Governor Cuomo accepted all 10 of the Council’s recommendations, which now will be incorporated into New York State’s Five-Year Strategic Plan for Diversity and Inclusion. The recommendations are below. The legislation would amend Civil Service Law to accelerate hiring of highly-qualified diverse candidates and enhance career mobility opportunities in State government, including greater flexibility in extending appointments and transferring between positions. New York will promote the benefits of a career in public service by implementing strategic outreach and marketing efforts aimed at providing the most compelling recruitment brand for New York State and its agencies. These efforts will educate the next generation of leaders on the value of public service and build a pipeline of new, diverse talent. The Department of Civil Service will expand testing venues to institutions of higher learning, including SUNY and CUNY, as well as community-based facilities, to improve recruitment and employment opportunities for diverse populations. The Department of Civil Service will develop and promote new exam preparation materials to encourage participation in Civil Service exams and better prepare exam takers for future success. This will include utilization of Department of Labor Career Centers and enhanced use of social media and other technologies to deliver exam preparation content in a more modern and accessible way. Agency leaders and managers must sufficiently possess the knowledge, skills, and resources to attract, hire, retain, and promote employees from diverse backgrounds. It is vital that all employees fully understand the expectations for equality in the workplace. New training will be required for all agency heads, executive leadership and staff responsible for recruitment and retention to cultivate a more inclusive work environment and provide the foundation to effectively implement policies and practices that promote diversity and inclusion in the workplace. The Department of Civil Service will establish new partnerships with the State Education Department’s Office of Adult Career and Continuing Education Services – Vocational Rehabilitation Center and the Department of Veterans Affairs, to increase the number of individuals and veterans with disabilities connecting to job opportunities. The New York State Civil Service Law, Section 55-b authorizes the New York State Civil Service Commission to designate up to 1,200 positions in the non-competitive class to be filled by qualified people with disabilities. Additionally, Section 55-c of the law authorizes the designation of up to 500 positions in the non-competitive class to be filled by qualified wartime veterans. The Department of Civil Service will promote the use of recruitment and workforce management tools to HR professionals in State agencies seeking viable candidates for positions. One such tool is the Diversity Management Option, which is used as part of a competitive exam, to fill vacancies when there is a demonstrated need for the trainee to have an understanding of diversity management and equal opportunity principles to perform the essential duties and responsibilities of the position. Deputy Commissioners for Administration will participate in HR program and policy meetings to be co-lead by the Department of Civil Service and the New York State Personnel Council. ADAPT meetings will require executive level participation and discussion on HR program and policy issues regarding diversity workforce management, ensure that State agencies adhere to strategic leadership and accountability strategies, follow consistent workforce management practices, and achieve diversity and inclusion goals. The current Affirmative Action Administrator position has historically been viewed as a compliance-based role. To embrace a broader perspective about the knowledge and tools needed to drive success and increase diversity in the State workforce, job responsibilities for current Affirmative Action Administrators will be evaluated and updated to better reflect the skills and competencies required by diversity practitioners to manage and lead diverse and complex organizations. Having consistent and well-documented diversity and EEO guidelines will make it clear to all that equality in the workplace is the standard, not the exception. New guidelines will reestablish a baseline for acceptable behavior and fairness and equality in the workplace. Assemblyman Marcos Crespo said, “Throughout his administration, Governor Cuomo has been a tireless advocate for diversity and inclusion, increasing access to the social and economic opportunities that all New Yorkers deserve, regardless of race or gender or culture. By embracing the recommendations of the Advisory Council and taking steps to increase diversity in public service, we will empower hard-working individuals contribute to the economic growth and diversity that the Empire State was founded upon. In New York, we know that diversity is our greatest strength, and I applaud Governor Cuomo for working to make our state even stronger." Governor Cuomo created the Advisory Council on Diversity and Inclusion in March 2016 and tasked it with identifying barriers to attracting, recruiting and retaining a diverse and highly-skilled workforce, and making recommendations for improvement. Minorities currently represent approximately 26 percent of the State government workforce, up from 23.2 percent in 2006. Caucasian employees represent 58.4 percent of the entire New York State labor workforce, but 74 percent of the New York State government workforce. The Council’s charge included examining relevant data and best practices in both the public and private sector, identifying challenges and opportunities within the existing civil service system, and collaborating with key State agencies and other organizations. Meetings were held with community stakeholders to facilitate a dialogue regarding diversity and inclusion in State government and to obtain and integrate informed stakeholder voices into the policy-making process. Subject: LongIsland.com - Your Name sent you Article details of "Governor Cuomo Announces New Actions To Increase Diversity In State Government"